Our mission statement captures the values most important to all of us here at All 4 Paws Veterinary Hospital. We strive for the highest quality care for our patients with a very personal touch for their owners in the process. We believe in offering the best medicine possible and will always work with you and your beloved pet to get them the care they need. At All 4 Paws Veterinary Hospital, we are proud to offer brand new, top-of-the-line equipment to help care for and heal our patients. From digital x-ray with reviews by boarded radiologists at no cost to the client, to an advanced in-house ultrasound unit and ultrasound specialist availability, to state-of- the-art anesthesia monitoring equipment and advanced class iv laser therapy, we have spared no expense to offer you the best. We serve Suisun City, as well as the surrounding communities of Fairfield, Vacaville, Cordelia, Rockville homes area, Green Valley homes area, American canyon, Vallejo, and the Bay Area. Dr. Brandwajn always welcomes new or current clients. Anything from a first puppy package, to a very serious emergency, we want you to feel comfortable that we have the equipment and knowledge needed to help your pet. If it is in the best interest of your pet to be referred to a specialist, then we will always tell you that. We are very lucky to have specialists such as a very talented internal medicine trained dr doing more complex ultrasound scans for us as needed, and a very experienced board certified surgeon doing advanced or specialty orthopedic services at our hospital. Dr. B has cared for my boxers for over 10 years! She is the best! Dr. B and her staff are the best vet in town and beyond. They care so much for the well being of any and all animals. They have cared for my fur babies for 8 plus years. Some other vets in town will give medicine when it's really note needed. Thank you so much for taking Silver off of steroids, it was the worst thing for my baby girl as she blew up like a pot belly pig and lost most of her fur. Thank you for all the love and support you have given to me and my fur babies Silver and Simon. Thank you Dr. B and the staff for your kindness and care today as we said goodbye to out sweet friend sparky. It meant so much to us. We just want to thank Dr. B and all the staff for the care they gave to our baby boy Apollo. Everyone was so caring of him and us all the way to the end. Staff is very friendly and welcoming! Care for both patients and caregivers is professional, thorough, timely, respectful, and truly caring. This is by far the best Vet. I have ever had. The staff is wonderful and the doctor is number 1 in my book...I will always take my Peeka here..
Everyone is alway extremely helpful curtious and eager to help Ani. They all seem geanuanly concerned. When my mother inlaws pittbull got cancer the staff was there for every question and concern that I had. Even would let me bother them with questions when they came to my job. Now im bringing my pitty to see Dr. Brandwajn. Thank you for everything. I am very pleased with the service my Pet has received here. Everyone is more than accommodating and friendly and knowledgeable. My only issue is The waiting time to have my pet seen. Waited 30 minutes just for a rabies shot. Even though it was near closing time the staff took care of my cat, They provided excellent service, and answered all of my questions to the fullest. The staff was very friendly and courteous. They stayed late to make sure my cat was taking care of. I can't thank you enough for taking care of Princess Diana. I was overwhelmed to learn she was so sick but you calmed my fears by assuring me you could get her back to a healthy dog. I am so grateful to have found you. The Dr. and the staff are just wonderful and so professional, Dr B is the best, she actually bonded with Boogie, she takes the time, makes me feel important. Every time I take Boogie in I learn quite a bit. Thank you Dr.
all 4 paws saved me 300.00 compared to my other vet. I feel confident about going to Dr. B again. I liked the way my dog and I were treated by everyone'we came in contact with. I continue to bring my pets to All 4 Paws Veterinary Hospital because I trust Dr. B and her staff. I don't feel like I'm being overcharged ever. My pets are treated with kindness and compassion every time we come in. Zoe just had her nailed clipped, and a rabies shot. The tech that cut her nails did the best job anyone has ever done! Thank you so much. 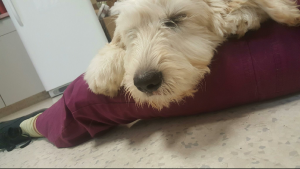 Once again, my "vet shy" dog loved your staff! Great peace of mind. Professional, caring and courteous! Patient with my fifty million questions and I am so appreciative to have found this wonderful place ! Friendly and knowledgeable staff. Our puppy felt so comfortable there, as did we! Dr. B was awesome! She did a great job with our puppy and help us out alot with different foods and meds we should be giving him to make him the best dog possible! Staff was all extremely friendly and knowedgable as well! Thank you guys! With Dr. Brandwjan,her love of animals takes priority over everything. She is NOT the kind of Vet who will turn away your pet if you cannot afford treatment; along with her staff she is a wonderful asset to Suisun! Dr. B and her staff are one of a kind..they have helped us with both of our dogs, when we have had no where else to turn. We may not of gotten the news we wanted with our dear shadow but Dr. B and her bedside manner was incredible. All of the staff members I have spoken with at All 4 Paws have been very kind, knowledgeable, and professional. Dr. B is extremely thorough and has gone above and beyond to help us decide which surgery option is best for our dog. Dr B is amazing with our animals. They're always a bit scared going to the vets but she soothes them and makes them feel so comfortable when she examines them. She treats all of our furbabbies with such love and care as if they were her own. It's customer service, attention to detail, compassion, empathy, professional knowledge, and service with a smile. The facility and staff are awesome. Everyone was amazing with my cats. My female tends to get a little grumpy when she gets to the vet and they were great with her!! Very friendly and caring toward my pets!! The doctor made time to review all the information needed to know​ and made suggestions that are crucial to my pets health. Your staff is fantastic! Made my visit and Q's easy and you ladies are awesome! All 4 Paws is genuinely interested in keeping me pets in excellent health. All of the staff are wonderful but I would like to mention Alicia specifically. She always showers Sammi with love and attention. Sammi absolutely adores her. Love you guys.